Lobbyists. They're everything that's wrong about Washington DC. Plying the hallways of power, these operators cut backroom deals and arm-twist politicians. Instead of strengthening democracy, they undercut it by securing favors for corporate clients and foreign dictator paymasters. If that's your perspective, then veteran lobbyist K. Riva Levinson's new book will rock your world. Choosing the Hero: My Improbable Journey and the Rise of Africa's First Woman President is an engaging blend of personal memoir, Washington exposé, and, most of all, a tribute to a beautiful friendship. Levinson's writing is raw and revealing. The story, like the author, jumps easily from a convoy in Baghdad to the halls of Capitol Hill. The book opens in 2011, in the dead of an Oslo winter, at a royal affair where the King of Norway is bestowing the Nobel Peace Prize on three remarkable women. Cut to Mogadishu, 1989. Levinson is a rookie lobbyist trying to prove herself within a notorious mercenary firm headed by Paul Manafort (yes, that Paul Manafort). After landing on a claptrap Boeing 707, she dodges insect hordes, eats bug-infested bread, and most of all struggles with her conscience. Her client is Siad "Mighty Mouth" Barre, the warlord-president of Somalia who would be toppled two years later, creating a vacuum that eventually led to US military intervention and the Blackhawk Down disaster. Nothing goes right on the trip and Levinson leaves wondering, not for the last time, why am I here? The meeting leads nowhere for Obiang, but it is the beginning of a long and fruitful relationship between Levinson and Sirleaf. A year later, a heavily pregnant Levinson sits in a northern Virginia diner, scarfing down donuts and hash browns as she pitches her services to Sirleaf. The then 57-year-old Harvard-trained economist is ready to leave the UN and run for president back home in Liberia against the notorious Charles Taylor. Shortly after, the "Warlord versus the Grandmother" campaign is launched. Their adventures together, through many ups and downs, eventually lead to victory in 2005, when Sirleaf is elected Africa's first female president. The bad news is that Liberia has been destroyed--physically, economically, and psychologically--by a long and brutal civil war that ended just two years earlier. Sirleaf is rebuilding her homeland almost from scratch. She needs help. And that's when Levinson's work really begins. Levinson fights a recurring battle against Washington indifference and "lack of imagination." Liberia, founded by freed American slaves in 1821, is a special place with a uniquely intimate relationship with the United States. The capital is named after James Monroe. One of its 15 counties is called Maryland. American influence in Liberia is immense, and Liberians often look to the United States for security, partnership, and reassurance. But sometimes America forgets about its African cousin. Throughout the story, Sirleaf keeps asking Levinson: "Is Washington listening???" 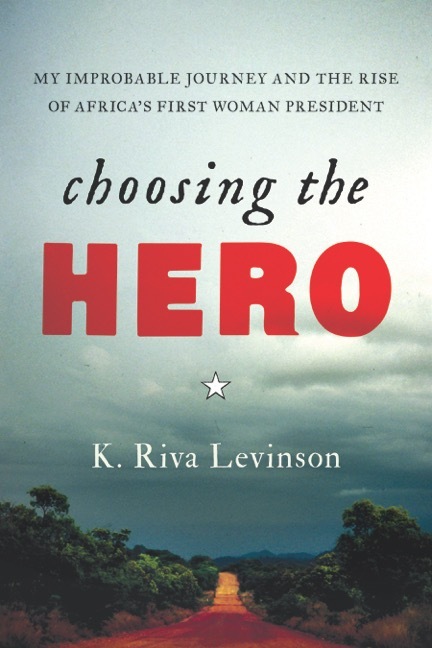 Choosing the Hero is for anyone interested in political history and the inside story of the rise of President Sirleaf, who also wrote the foreword where she calls Levinson her "secret weapon." The book will appeal to readers who love memoirs about smart ambitious women navigating a dangerous world and finding a calling. "I have to believe in something. I have to believe it's something for the good," Levinson writes. Above all, Choosing the Hero shines by showing how Washington DC can work. Levinson writes, "History can be made in different ways--not only by the generals or the elected (and unelected) officials, but sometimes by the efforts of anonymous people who work, plan, scheme, manipulate, even horse-trade behind the scenes in order to achieve our goals." That's exactly what she did repeatedly for Liberia, greasing the wheels of a creaky US foreign policy machine. With appropriate humility, she shows how calling the right person, making the right argument, haranguing the right staffer can help to get things done. In 2005, US officials were passive during Liberia's election in part because they had already decided that Sirleaf had no chance of winning. So Levinson worked contacts at the CIA to share new information from the field about Sirleaf's growing support base. She hoped, correctly as it turned out, that a small nudge could break the perception that her candidate couldn't win, and force the US to get more engaged. In 2014, when the US dragged its feet in response to the Ebola outbreak, Levinson arranged for Sirleaf to call 10 congressional leaders in a frenzied 48 hours. This proved critical to finally getting White House action. If I have one gripe about the book it's that Levinson is too easy on American officials for mistakes and overly generous with credit to some who were, in reality, less than helpful. This is especially true for certain legislators and Clinton administration officials who were far too quick to accept Charles Taylor in 1997 and were willing to turn a blind eye to his atrocities. In 2012, a UN Special Court convicted Taylor on 11 counts of crimes against humanity and he's currently serving a 50-year sentence in a British prison. Of course, Levinson is too gracious to point out the hypocrisy of those who had once championed this war criminal. That fits Levinson's approach and character. As her extraordinary book and personal story reveal, she's made her life not about settling scores, but about bringing people along on shared missions to get things done. She's a lobbyist making peace with her past and devoting her skills to a better world. In so doing, Levinson helped herself find purpose, helped the Liberian people, and, ironically, repeatedly helped the United States achieve its own policy goals. I know something about Levinson's passion and tactics because I have occasionally been on the receiving end. I was a senior State Department official when, one day in 2007, a woman I didn't know showed up in my office unannounced. "So where are we with the budget for vetting and training the Liberian armed forces?" I had in fact been struggling to secure the money for promised reforms of the security sector--a critical pillar of the peace and reconstruction plan--but I wasn't about to say anything to a lobbyist. I gave a vague answer hinting that there might be a hang-up. "I'm on it," Levinson said confidently. And she was. Todd Moss is chief operating officer and senior fellow at the Center for Global Development. Moss also serves as secretary of the board. His research focuses on U.S.-Africa relations, energy policy, and private investment. Moss is currently working on electrification in Africa, cash transfers in new oil economies, and ideas for upgrading US development policy. In the past he led the Center's work on Nigerian debt, Zimbabwe, the future of the World Bank's IDA, and the African Development Bank. Moss served as Deputy Assistant Secretary in the Bureau of African Affairs at the U.S. Department of State 2007-2008 while on leave from CGD. He originally joined the Center in July 2003 from the World Bank where he served as an advisor to the Chief Economist in the Africa Region. Previously, he has been a Lecturer at the London School of Economics (LSE) and worked at the Economist Intelligence Unit (EIU) and the Overseas Development Council (ODC). Moss is an Adjunct Professor at Georgetown University and the author of numerous articles and books, including Adventure Capitalism: Globalization and the Political Economy of Stock Markets in Africa (Palgrave Macmillan, 2003), African Development: Making Sense of the Issues and Actors (Lynne Rienner, 2nd ed., 2011), and Oil to Cash: Fighting the Resource Curse with Cash Transfers (CGD, 2015). Moss is also the author of an international thriller series from Penguin's Putnam imprint about a State Department crisis manager which includes The Golden Hour (2014), Minute Zero (2015), and Ghosts of Havana (forthcoming 2016).